Managing a media-heavy site that auto-upgraded to WP 4.6.1 overnight (8 Sept 2016). On new media uploads, WP is now changing the title to a concatenated string with escape characters rather than leaving the title as the original filename. This is an issue as I have relied on clean original filenames as titles for images; now each image title must be individually edited after upload as the WP-assigned title is decidedly unfriendly to audience users. This behavior occurs only on new uploads and does not effect already resident media. 37989.diff​ (702 bytes) - added by joemcgill 3 years ago. 37989.2.diff​ (663 bytes) - added by joemcgill 3 years ago. 37989.3.diff​ (1.9 KB) - added by joemcgill 3 years ago. 37989.4.diff​ (678 bytes) - added by SergeyBiryukov 3 years ago. Thanks for the report. This looks like a consequence of , which was an intentional change but may be more strict than is necessary. #37989 was marked as a duplicate. And if the title is in Cyrillic, it gets urlencoded and becomes completely unreadable, e.g. Изображение 1 turns into %d0%98%d0%b7%d0%be%d0%b1%d1%80%d0%b0%d0%b6%d0%b5%d0%bd%d0%b8%d0%b5%201 :( Same for Arabic, Japanese, and other non-ASCII alphabets, I guess. Confirmed on all releases  was backported to: 3.7.16, 3.8.16, 3.9.14, 4.0.13, 4.1.13, 4.2.10, 4.3.6, 4.4.5, 4.5.4, 4.6.1. #37987 was marked as a duplicate. In examining the code for , it appears that the sanitization routine is implemented for the title as well. I can understand the logic for sanitizing filenames, but title is overkill; especially as there is (a very tedious) work-around by manually editing the media title in WP Media Manager. It would be helpful to start building a list of filenames and expected titles that are based on those filenames so that we can build out tests. A list in tests is also being built as part of #22363 that should also be useful here. Also worth noting is that  has changed the behavior in 4.7 trunk so that the file extension remains as part of the attachment title. We'll want to fix that as well, but it may cause confusion short term with any tests that are written. #38016 was marked as a duplicate. Can you help me with using this workaround? Do I just paste the code in my child theme's functions.php code? I tried that and it didn't seem to work. Do I just paste the code in my child theme's functions.php code? Correct. It only works for newly uploaded images though, existing ones will have to be renamed manually. I pasted the coded in child theme's functions.php. I've tested the workaround; while it's going in the right direction; still does not produce clean, usable media titles as were present in 4.6.0 and prior. Please don't use default Windows Notepad to edit PHP files. It's known to cause the "headers already sent" warning due to a ​byte order mark (BOM) it inserts into UTF-8 files. The file should be re-saved in UTF-8 without BOM using Notepad++ or other editor. See ​How do I solve the Headers already sent warning problem? (English) or ​Cannot modify header information (Russian) for more info. UTF-8 without BOM - OK. But now title and ALT of image "file-name-nomber-one.jpg"
file name "file name nomber one.jpg" and title and alt should be ""file name nomber one"
I changed the work-a-round a bit to get the same behavior as before, so setting the filename (without extension) as the post-title. 37989.diff​ Should restore the previous behavior, by using sanitize_text_field() instead of sanitize_title() to sanitize the post titles that are generated. This also fixes the addition of file extensions to file names, which was introduced in . 37989.2.diff​ uses PATHINFO_FILENAME instead of PATHINFO_BASENAME to get the file name without an extension, as proposed by @hcarsten above. 37989.3.diff​ simplifies slightly from 37989.2.diff​ and adds a unit test to at least cover the most basic expected behavior. It would be nice to be able to create unit tests for multiple edge cases, but I would first want to refactor media_handle_upload() so the logic that creates the attachment parameters was isolated from the process of uploading an image and inserting the data into the database. Currently, the only way to test this behavior is to execute an upload of a file, and then test to see if the title of the post created for that attachment that is matches our expected file name. If we were to create a large number of these tests, the upload process would become a pretty big drag on our test suite, which I'd like to avoid. try my fix comment 20 above. We had the same problem with PDF files also. "Dette er en test, æøå ÆØÅ & halløj"
As a previously poster mentioned, sanitizing the FILENAME makes good sense, but the TITLE should be left unchanged in my opinion. Btw ​https://wordpress.org/plugins/code-snippets/ is great for testing fixes like that without having to edit the files manually. Anyone able to create a fix, that leaves the title alone? #38075 was marked as a duplicate. This ticket was mentioned in ​Slack in #core by janr. ​View the logs. This ticket was mentioned in ​Slack in #core-images by janr. ​View the logs. #38087 was marked as a duplicate. #38090 was marked as a duplicate. 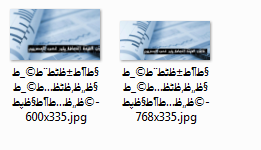 Arabic (UTF-8) filenames are now shown with percentage encoding too. The files are uploaded with correct file names to the server, and the slugs are shown with correct Arabic characters, but the file names in the media library are percentage encoded. This means the users have to ename every single file they upload to the media library. or manually rename every single file after upload? @Coptic-Treasures can you make sure you testing using the latest nightly version of WordPress? In my testing, filenames with Arabic (or other non-english UTF-8 characters) are not being URL encoded after this change. I installed latest nightly version and now the Arabic names do not get converted to URL encoded. However, the first word of the file name gets omitted. Please check this screenshot (Arabic is RTL so the first word is the right most word). Finally got a chance to look at this ticket again. For the 4.7 branch, it's a bit more complicated. The issue with pathinfo() is that it depends on PHP locale and does not always work correctly with UTF-8 characters, leading to an issue with truncated titles mentioned in comment:40. We've encountered similar issues with basename() before, see #21217 and #23267. 37989.4.diff​ uses wp_basename(), which is the i18n-friendly version of basename(), designed to work correctly with multibyte file names. I've also updated my workaround in comment:11 to use the same solution. (It should work in 3.9.14+, as the wp_insert_attachment_data filter does not exist in 3.7.x or 3.8.x). Sorry I am new to the system. Does your reply means that I need to provide more testing, or this issue will be looked after by the Wordpress team? Thanks @SergeyBiryukov. 37989.4.diff​ looks good to me. I'd still like to refactor so we can add additional unit test without needing to upload actual files each time, but that can be handled separately. For reference, the current code in the 4.7 branch was introduced in  (for #37608). Left a comment about UTF-8 file names on that ticket as well: comment:14:ticket:37608. As @SergeyBiryukov mentioned,  needs to be backported to previous branches, going back to 3.7. I updated the Wordpress version to (4.7-alpha-38672) now, but the problem still exist. Please ignore my message if it is not helpful. I am just trying to help by reporting. @Coptic-Treasures – Thanks for the quick eye. However, you'll have to wait for the next nightly version to get have this fix included. Sorry if obscuring this ticket with irrelevant feedback, but I really needed to find a fix on this. When uploading many files each day, with proper names, its quite a nuisance having to re-enter the title each time.. This snippet works for me, leaving the title alone. I've got my spaces and my special characters - just as I need it. This is most likely not a proper solution for everyone, but at least is shows what end results is needed by some. It would also affect post slugs though, as they would no longer be run through sanitize_title_with_dashes() and might contain spaces and other characters: http://example.com/2016/10/My%20new%20post/. Have you tried the snippet from comment:11? Yes, I just gave the workaround in comment #11 a shot, and it works beautifully, just what I need. The titles are fine again, and slugs not affected. Thanks! There was an issue I had with the proposed fixed. The fix itself worked, but was causing titles to become blank if updating a media item. This was because the fix did not account for an empty $postarrfile? on updates. #38649 was marked as a duplicate. Searching for a solution myself I stumbled upon this thread. Happy to say, I found a way to fix this. EDIT: My first approach was a bit simpler, but I missed the fact that sanitize_title() is also used for creating slugs for posts etc. Luckily, WordPress uses two different variables to sanitize the title and the filename. We need to determine if a title is the file we just uploaded. The only way to do this is to browse the $_FILES global. First, we need to control the way filenames are sanitized. I prefer pure ASCII without spaces. Next we check if sanitize_title() wants to change our filename. The function also knows the original title, the same we sanitized right after upload. After sanitizing it must match the filename found in the $_FILES global. I simply put the code in the functions.php of my theme. I hope it is useful for you. Enjoy! This ticket was mentioned in ​Slack in #core-media by helen. ​View the logs. Now that the 4.6.2 milestone got renamed 4.7.1, this can be considered resolved because it was already fixed in trunk for 4.7. I'll backport the fix to the 4.6 branch so the fix goes out with our next security release regardless. Looks like  fixed this issue sufficiently for the 4.6 branch. The remaining work here would be to backport the change to use sanitize_text_field() instead of sanitize_title() in all other branches (down to 3.7) where it was applied.